Private jet charter to WEF in Davos 2016 shows slight decrease in traffic. 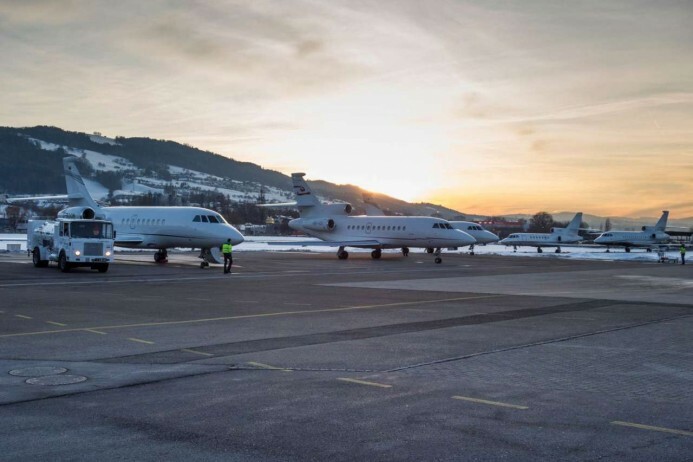 Private Jet Charter World Economic Forum highlights the four major airports used for last week’s World Economic Forum (WEF) at Davos, Switzerland, drew 440 business aircraft and nearly 1,100 aircraft movements, according to business aviation analyst WingX Advance. This was down slightly from last year’s WEF. Business aircraft averaged 220 daily movements at Zurich (LSZH), Dubendorf (LSMD), Altenrhein (LSZR), and St. Moritz (LSZS) from last Tuesday through Saturday, down 6.5 percent from the 235 movements tracked daily during the WEF last year, WingX reported. Last Tuesday marked the busiest day, with a collective 170 departures and 104 arrivals. Private jet charter World Economic Forum figures show Zurich handled 62 percent of the aircraft, with Altenrhein the next busiest airport. Jet Aviation Zurich, which prepares months in advance for an uptick in traffic during the WEF, handled 612 movements, 1,830 passengers and 306 of the aircraft at both Zurich and Dubendorf during the event. The company brought in employees from its bases in Geneva, Dusseldorf, Munich and Dubai to handle the increased traffic. Courtesty Aviation International News (AIN).